Silver Sands Racquet Club is one of the deserts most desirable tennis clubs featuring 8 premier tennis courts and an on-staff tennis pro November through May. This is a semi-private tennis club so guests are welcome to play at the current court rates. Guests will also enjoy the community-planned activities throughout season and are invited to join in and meet your neighbors at the weekly Wednesday night Pot Luck Dinner. Every home is only steps away from one of the 15 sparkling pools and spas located throughout this gated community and all homes are ground level with a double car garage, washers and dryers, bar-b-que grill and private patios. Each property is privately owned, turnkey furnished and uniquely decorated by the owner. Location Location Location Silver Sands Racquet Club boasts one of the best locations in the desert! 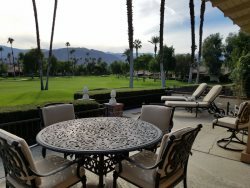 Located in the very heart of Palm Desert youll find yourself just moments away from the El Paseo (the Rodeo Drive of the desert), shopping, theaters and the best restaurants in the desert. Enjoy a round of golf at spectacular Desert Willow Golf Club just across the street or a spa day at the world famous Desert Springs Marriott Resort and Spa next to Silver Sands.